Even the wheel covers are blinging in this city (but not to worry, it’s all for a good cause). It seems somebody misheard the statement, “expensive, flashy stuff in Dubai never gets tiring,” as four tyres worth an incredible sum of Dhs2.2 million have just been developed. A concept from local company Z Tyres, the tyres are covered in 24-carat gold, as well as diamonds – with Guinness World Records verifying that the tyres are the most expensive in the world. It’s not all flash though – in true Ramadan spirit, all the money made from selling the tyres was donated to the Zenises Foundation, a charity that focuses on improving access to education around the globe. After being designed in Dubai, the tyres were sent to Italy to be decorated by artisan jeweler Joaillier Prive, before being transported to Abu Dhabi to be covered in gold leaf by the same craftsmen who are working on the new presidential palace in the UAE’s capital. So if you were looking for a new accessory to slap onto your double-digit license plate Lambo, these tyres may fit the bill. 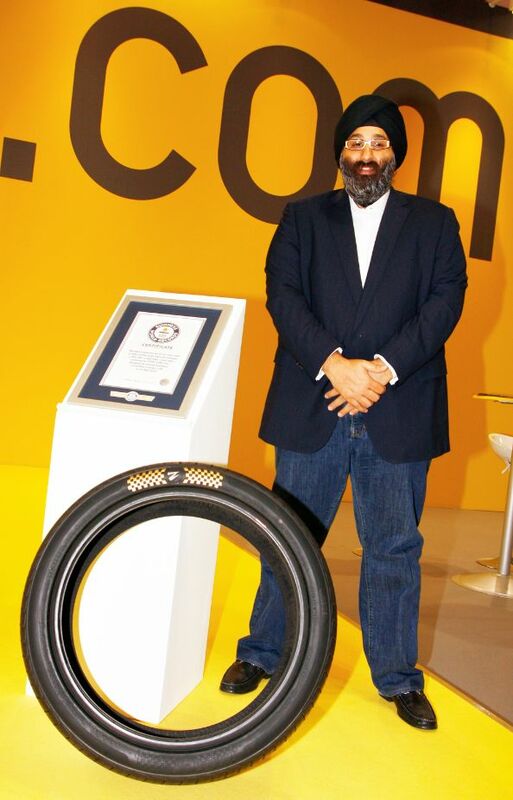 CEO Harjeev Khandari stands proudly with his creation and the Guinness World Record. “In keeping with the spirit of the holy month of Ramadan, Z Tyres will donate all profits from the $600,000 sale to the Zenises Foundation which focuses on improving access to education across the world,” he added. – For more news and views on Dubai straight to your newsfeed, like us on Facebook.